SMALL: Design measures 14" x 10"
MEDIUM: Design measures 18" x 13"
LARGE: Design measures 25" x 18"
EXTRA LARGE: Design measures 36" x 26"
This breathtaking Elephant stencil was drawn by stencil designer Janna Makaeva when she was inspired by geometric tribal elephant tattoos. Check out all the amazing detail! 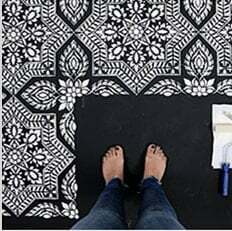 This intricate, but easy-to-use stencil will produce a stunning wall accent wherever you put it. You can also use a small elephant stencil for the furniture painting project. If you’re an elephant lover, like we are, this stencil design is a must for your collection! While it takes an experienced stencil artist to draw a high quality designer stencil, stenciling itself is an easy painting technique that doesn’t require an artistic ability. As long as you can hold a brush or a roller, you’re pretty much good to stencil! Get creative: overlap the stencil, use different colors, create your own allover stencil pattern, add shading - possibilities are endless. You can even make it somewhat 3D by troweling plaster through the stencil. You can stencil over flat or eggshell latex paint, plaster, faux finish background or even wallpaper if it is in decent condition. This ornate elephant stencil is so easy to use, virtually anyone can do it. Simply tape it to the wall using BLUE painter's tape, then load your foam roller with the paint of your choice (latex or acrylic). Get rid of excess paint by rolling the foam roller over a folded paper towel. Then, just roll it over the stencil applying medium pressure for an instant fabulous result! Don't press on the roller too hard otherwise you might get some bleed. Transform your room in less than 1 hour! Want to learn the easiest wall stenciling technique? Here are the detailed illustrated Roller Stenciling Tips. Although most of our wall stencils do not require the use of spray adhesive, if your walls have a texture to them, it might be a good idea to use spray adhesive to help minimize paint seepage (Elmer's spray adhesive seems to be the best). Make sure you shake the can well and lightly mist (not drench) the stencil, and let it dry for a moment before positioning it on the wall. This step will prevent the adhesive residue transferring to the wall. You'll need to re-mist the stencil after a few repeats. Note: you will still need to hold the stencil in place with a few pieces of blue painters tape! Adhesive by itself is not enough to hold the stencil on the wall. Clean-up tip: Spray the stencil with Simple Green to help to remove adhesive residue and let it sit for a while before cleaning with soap and water. Please note that it is virtually impossible to get rid of all adhesive residue. That's why we personally prefer not to use it and just stick with painter's tape!